The Cotswold is an ancient breed of sheep descended from sheep that grazed the Cotswold Hills at the time of Caesar’s conquest of Britain. In the Middle Ages, Cotswold wool was a major export of England, contributing greatly to the wealth of the country as a whole and particularly to the Cotswold region, where the wool churches and large houses remain as evidence of its importance at that time. Cotswolds are a large breed, noted for their long, coarse fleece of naturally wavy curls and the tuft of wool on their foreheads. The earliest record of Cotswolds in the United States is 1832. The Cotswold is classified as a “rare” breed by the American Livestock Breeds Conservancy. One of the world’s most beautiful and rare sheep comes from the hills of the Cotswolds in England, less than 20 miles from the Welsh border. 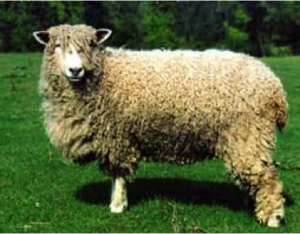 They are thought to be descended from a longwool introduced by the Romans in the first century A.D. This prototype sheep gave birth to the Cotswold, Lincoln and Leicester. The Cotswold was well established by the 15th Century and the wealth obtained from these “gentle giants” paid for many of the great Cathedrals and churches in England, most notable Gloucester Cathedral. The word Cotswold stems from the wolds (hills) and cotes (enclosures) which housed the sheep in bad weather, hence the wolds of the sheep cotes. Cotswolds played a great part in early American farming history even though today they are rare. They were first introduced by Christopher Dunn into New York, near Albany in 1832. By 1879 this was the most popular breed in America. By 1914 over 760,000 were recorded and it was still a very popular breed in the West until Merinos were introduced from Australia. Merinos had the finest fleece and quick maturing lambs. By the 1980’s there were fewer than 600 Cotswolds in all of Britain and in the US; in 1993 there were less than 400 lambs registered. Thanks to the American Livestock Breeders Conservancy and other groups, Cotswolds have been removed from the “rare breed list” and are enjoying popularity among spinners. The Cotswold can yield 15 pounds of wool per shearing with the fiber up to 12″ long. It is highly lustrous fleece with a micron count in the 40s and is sometimes called poorman’s mohair. The Cotswold is a large, polled breed, with ewes weighing up to 200 pounds and rams 300 pounds. The ewes are excellent mothers, with few birthing problems and quick to accept lambs. They are a very friendly sheep and there is definitely a queenly quality about the ewes. The meat has a very mild flavor and aroma. It has been proven that long wool sheep have a less muttony flavor than fine wooled breeds. Cotswolds are easy to raise and do well on coarser feeds and are excellent foragers and can thrive in harsh climates, even with a lot of rainfall. The earliest Cotswolds were white but black Cotswolds were recorded in Kentucky in 1858. They are even rarer than the whites, and it is not known if the incidence of color is due to recessive genes or some fence jumper from long ago! They should have the same characteristics as the whites. There is a revved interest in Cotswolds due to the desire of sheep growers to improve wool quality and produce lean, heavyweight lambs on less feed.